A coalition of interests has emerged around the notion of Transboundary Natural Resource Management (TBNRM) in Southern Africa. Deep green ‘bio-regionalists’, conservation biologists and neo-liberal development advocates have found common cause in espousing the re-establishment of ecological integrity across ‘artificial’ frontiers and administrative boundaries. 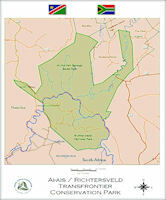 The flagship Great Limpopo Transfrontier Park initiative spans Zimbabwe, South Africa and Mozambique. The Great Limpopo initiative was very much a South African driven process, and much of the momentum was provided by the Peace Parks Foundation. "Peace Park" was the term adopted by the World Conservation Union in the 1980s to describe a transfrontier conservation area -- a region which embraces the land of more than one nation, unifying fragmented ecological habitats and promoting environmental and political stability. Southern Africa has long held great potential for peace parks, but conflicting national interests and ideologies have hampered efforts to realize this dream. With the region experiencing stability for the first time this century, the Peace Parks Foundation has emerged to take the lead in promoting the enormous opportunities that enlarged wildlife areas will bring. 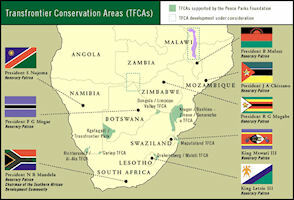 A historical International Agreement for the development of the Gaza / Kruger/Gonarezhou (GKG) Transfrontier Park and Transfrontier Area was signed by these Ministers on 10 November 2000 to pave the way for the establishment of this Transfrontier Park. When fences are eventually removed, the Park will consolidate nearly 100 000 km2 of pristine wildlife area - an area bigger than Portugal - to create an animal kingdom stretching across the borders of Mozambique, South Africa and Zimbabwe. It is envisaged that the new cross border park would eventually enable the translocation of up to 1000 elephants from the Kruger National Park. Funding for this initiative still needs to be secured. It was hoped that this Transfrontier Park will become a tourist mecca creating the necessary jobs in an area where currently unemployment and poverty brought about by years of political unrest and other factors, are high. A tender was awarded for the drawing up of an Integrated Regional Tourism Plan and it was foreseen that within a very short space of time the current 4000 beds will be increased to 7000. In order to ensure proper bio-diversity management, more than 200 game guards alone would have to be trained. Various initiatives are currently in progress with assistance from donor organisations such as the World Bank and USAID Regional Center for Southern Africa.The first phase is the development of Coutada 16, which has been made possible by a grant of over R40 million from the German development agency Kreditanstalt für Wiederaufbau (KfW). This regional project will be implemented with the support of the Technical Committee of the Southern African Development Community's Wildlife Sector. KfW, in conjunction with the Mozambique Wildlife Authority and the Peace Parks Foundation, are undertaking a project development mission after which project activities such as fencing an area of up to 400 km would commence. The plan was to open sections of the park by November 2001. An essential prerequisite for the new park is the development and construction of a new border post and an entrance gate on the border between the two countries. In April 1999, South Africa and Botswana announced that they had agreed to make one of those dreams come closer to reality. They signed an agreement to jointly manage eventually two parks contiguous to each other, the Gemsbok National Park in Botswana and the Kalahari Gemsbok National Park in far northwestern South Africa. The combined park, 14,000 square miles in size (about as big as Massachusetts, Connecticut and Rhode Island combined), will be called the Kgalagadi Transfrontier Park (pronounced kuh-HAHL-uh-HOD-ee, the name is an attempt to get closer than "Kalahari" to the original word for "place of thirst" used by the San people, or Bushmen). The parks are remote; just to drive to the entrance from Johannesburg or Gabarone, Botswana, 400 to 600 miles, can take two days. Each of the two parks still runs its own affairs and build its own tourist facilities, but they adhere to a master plan. They share entrance fees equally but keep the money they earn from renting out chalets and campsites. The two parks have operated largely as one since the Botswana park was founded in 1938 (the South African one was founded in 1931). The border is the dry bed of the Nossob River, which is up to half a mile wide in some places; the road going along it meanders back and forth between the two countries. There is no fence.